I have always thought that poppies are beautiful. I love spending summer days in the park just looking at fields of poppies. Last year, I noticed poppies growing in the garden of a house in our neighbourhood. The lady promptly asked me whether I knew how to grow poppies. I said "no". That winter the elderly lady offered me the dried poppy seeds from her garden. I kept them safely until three days ago. 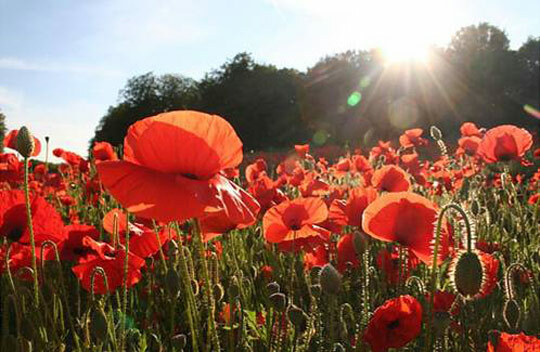 Poppies have long been used as a symbol of sleep, peace, and death. In Greek and Roman myths, poppies were used as offerings to the dead. Poppies used as emblems on tombstones symbolize eternal sleep. A second interpretation of poppies in Classical mythology is that the bright scarlet colour signifies a promise of resurrection after death. There are various different types of poppy listed here. Ancient physicians of Egypt used poppy seeds as pain relief and modern medicine shows us that morphine and codeine is derived from it. Growing poppies is relatively simple.